We show theoretically and experimentally that twisting a birefringent periodically poled fiber with an artificially induced χ(2) results in second-harmonic phase-matchings that are not permitted in untwisted fibers. We further demonstrate that both the strengths and the spectral positions of the generated second-harmonic signals can be controlled by changing the amount of twist. Of particular interest is a type II phase-matched signal emerging through and greatly enhanced by the twisting. R. Ulrich and A. Simon, “Polarization optics of twisted single-mode fibers,” Appl. Opt. 18, 2241–2251 (1979). M. Monerie and L. Jeunhomme, “Polarization mode coupling in long single-mode fibres,” Opt. Quantum Electron. 12, 449–461 (1980). X. Chen, M.-J. Li, and D. A. Nolan, “Polarization mode dispersion of spun fibers: an analytical solution,” Opt. Lett. 27, 294–296 (2002). S. Feldman, D. Weinberger, and H. Winful, “Polarization instability in a twisted birefringent optical fiber,” J. Opt. Soc. Am. B 10, 1191–1201 (1993). Y. Liang, J. W. Lou, J. K. Andersen, J. C. Stocker, O. Boyraz, M. N. Islam, and D. A. Nolan, “Polarization-insensitive nonlinear optical loop mirror demultiplexer with twisted fiber,” Opt. Lett. 24, 726–728 (1999). T. Tanemura, K. Katoh, and K. Kikuchi, “Polarization-insensitive asymmetric four-wave mixing using circularly polarized pumps in a twisted fiber,” Opt. Express 13, 7497–7505 (2005). A. Canagasabey, C. Corbari, Z. Zhang, P. G. Kazansky, and M. Ibsen, “Broadly tunable second-harmonic generation in periodically poled silica fibers,” Opt. Lett. 32, 1863–1865 (2007). C. Corbari, A. Canagasabey, M. Ibsen, F. Mezzapesa, C. Codemard, J. Nilsson, and P. Kazansky, “All-fiber frequency conversion in long periodically poled silica fibres,” in Optical Fiber Communication Conference, Vol. 5 of 2005 OSA Technical Digest Series (Optical Society of America, 2005), paper OFB3. A. Canagasabey, C. Corbari, A. V. Gladyshev, F. Liegeois, S. Guillemet, Y. Hernandez, M. V. Yashkov, A. Kosolapov, E. M. Dianov, M. Ibsen, and P. G. Kazansky, “High-average-power second-harmonic generation from periodically poled silica fibers,” Opt. Lett. 34, 2483–2485 (2009). E. Y. Zhu, L. Qian, L. G. Helt, M. Liscidini, J. E. Sipe, C. Corbari, A. Canagasabey, M. Ibsen, and P. G. Kazansky, “Measurement of χ(2) symmetry in a poled fiber,” Opt. Lett. 35, 1530–1532 (2010). There are small ripples near each of the main peaks in Fig. ; we have conjectured that these “sidelobes” are due to an imperfect QPM grating fabrication process. 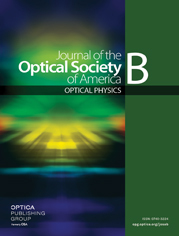 F. Treviño-Martínez, D. Tentroi, C. Ayala-Díaz, and F. Mendieta-Jiménez, “Birefringence assessment of single-mode optical fibers,” Opt. Express 13, 2556–2563 (2005). P. McIntyre and A. Snyder, “Light propagation in twisted anisotropic media: Application to photoreceptors,” J. Opt. Soc. Am. 68, 149–157 (1978). Fig. 1 Experimental SHG spectrum of the untwisted poled fiber is plotted against the fundamental wavelength λ F , showing the expected 1:9:4 ratio for the peak conversion efficiencies of each signal. See [10, 11] for details. The inset shows the fiber cross-section, where one of the principal axes ( x ) is also aligned to the direction of the frozen-in DC field E x DC . Fig. 2 Theoretical efficiencies | ( 2 − δ J K ) χ ̂ I J K ( 2 ) | 2 for the six SHG signals are plotted as a function of twist. The efficiencies are scaled to reflect the experimentally obtained η SH values of the untwisted fiber. The X + X → Y phase-matching is not visible because its estimated efficiency is significantly smaller than the other SHG signals. The parameters used for this plot were the birefringence at the fundamental ( δ β ( ω 0 ) = 7.4 × 10 − 5 μ m − 1 ) and SH ( δ β ( 2 ω 0 ) = 13.6 × 10 − 5 μ m − 1 ) , the length ( L = 23 cm ) of the PPSF, and the elasto-optic coefficient ( g = 0.15 ) . Fig. 3 Experimental SHG setup for the twisted poled fiber. (a) The poled fiber is fusion-spliced to connectorized standard SMF on both ends; one connectorized end is held fixed, while the other end is placed on a rotation mount, where it is free to rotate. A translation stage is used to keep the fiber taut, so that it does not curl when twisted. (b) A fiber-based PBC combines two orthogonal polarizations ( X ( ω 0 ) ↕ , Y ( ω 0 ) ∘ ) of light from EDFA-amplified CW tunable laser sources (TLS) in the 1540–1560 nm range. Fiber polarization controllers (FPCs) control the polarization state of light being launched into the PBC and poled fiber, with FPC1 and FPC2 used to align the input beams to the principal axes of the PBC, and FPC3 used to align the two orthogonally polarized beams to the polarization eigenmodes of the twisted PPSF. (c) At the output end of the fiber, the SH ( λ SH ) and fundamental ( λ F ) light are separated with a WDM; the power and polarization at λ F is measured with a polarimeter, while a silicon (Si) detector monitors the SH power. Fig. 4 (a) Experimental SHG spectrum for the poled fiber at varying twists ( red = 0 rev , white = 0.58 , black = 1.02 ). The inset shows the spectrum for the Y + Y → Y phase-matching, also for the three values of fiber twist. (b) A scatter plot of the experimental η SH for all signals at varying rates of twist. For comparison, the theoretical prediction for each phase-matching is drawn as a solid line; the curves used here are identical to those found in Fig. 2. Note that the X + X → Y phase-matching is so much weaker than any of the other five signals that it is not observed above the measurement noise floor. Fig. 5 Theoretical SHG spectrum for the twisted fiber at the same values of twist ( red = 0 rev , white = 0.58 , black = 1.02 ) as in Fig. 4a. Observe that the spectral separation between the X + X → X and Y + Y → X signals increases as the amount of twist changes from 0 to 1 revolutions. The insets show the spectra for the Y + Y → Y and X + X → Y phase-matchings, which have significantly smaller conversion efficiencies than the other four SHG signals. Figures 2, 4b, and this figure were created using the same parameters. Fig. 6 (Fundamental) Wavelength separation between the X + X → X and Y + Y → X peaks is plotted against the amount of twist applied to the fiber. The solid line is the curve of best fit given by Eq. (13); this fitting provides another measure of the birefringence ( δ β ( ω 0 ) ≈ ( 9.2 ± 0.7 ) × 10 − 5 μ m − 1 ) for the untwisted fiber at the fundamental wavelength. The elasto-optic constant g is once again taken to be g = 0.15 .